We are pleased to announce this week's Featured Retailer is Caye of Inspired by Baby /Knickernappies on Hyena Cart located in Eugene, Oregon! Tell us a little about yourself and your family and how your business came to be-It is kinda funny how I met Heather and got invited into the Knickernappies family. In 2006, I was pregnant with my first daughter and doing some internet research on cloth diapering. I came across Heather's website www.clothdiaperoutlet.com and saw a help wanted link on her home page so I emailed her. I had been sewing clothes and things for myself for several years and wondered if I could sew diapers. Come to find out she lived only a couple miles from me in Eugene,Oregon so I went to meet her one day. She showed me how to sew a diaper and gave me the pattern and some fabrics to practice making some. She like what I did, and I have been sewing custom Knickernappies ever since. Heather owns the Hyena cart store but wasn't using it, so she lets me run it to sell the customs as well as my own creations under the label "Inspired by Baby". I make minkee topped changing pads, wetbags, wipes, play block, and baby blankets. 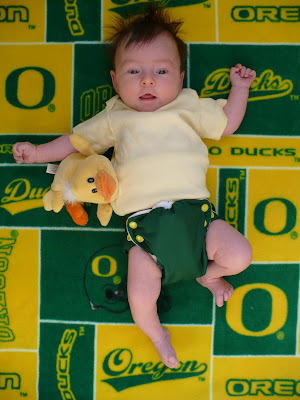 I sell some of these items in a baby boutique here in Eugene as well as the custom diapers. After my daughter was born, I also worked for Heather packing orders for her retail diaper business. Our daughters have grown up together and become playmates and we have all become like family. She has taught me everything I know about cloth diapers and has helped me through so many tough parenting moments by sharing with me her own experiences. If I have a question about cloth diapers or how to handle a 2 yr old temper tantrum, I ask Heather. She is a wealth of information and always willing to help us out. We now have a 9 month old daughter, Josie, and look forward to her playing with Heather's new baby. My husband is an English teacher at OSU in Corvallis, Oregon and also writes fiction short stories. He was a little leary about using cloth diapers in the beginning, but we learned how to do it together and now he loves the aspect of saving money and the environment however we can. My two year old loves picking out which diaper she wants to wear (and it usually has pink in it somewhere!). Heather has used a couple photos on her website of Sabrina, my two year old, wearing KND's when she was a newborn. When Sabrina was 9 months old, Heather wanted a photo of a baby wearing her diaper for a pamphlet, so we took some of Sabrina and she used one of them. It was so exciting to see our baby in print! What do you like best about being in the cloth diaper industry? What I love about cloth diapering is that I can mix my love of colors and patterns with a practical application, not to mention that sewing allows me to get away from the stress of parenting and be an artist for a little while. I also love the fact that there is a resale market for cloth diapers which allows us to sell some of our older diapers and get new ones. I have met some great women buying, selling, and trading new and used diapers that I wouldn't have met otherwise. What are your favorite Knickernappies products and why? My favorite Knickernappies product (besides the diapers of course!) is the Fluff Dust. What a simple product that helps so much with a smelly diaper pail. I love the Satsuma Twist scent the best because it has a nice, clean citrus smell. I also love her LoopyDo and SuperDo inserts. They are so absorbent and a great add on sale for my diapers! Of all your Custom KN Diapers, what are your favorite color/print combos? Two of the most popular custom combos I have done over the years is a red PUL outer with a cow print suede cloth inner and black and white snaps, and a pink PUL outer with a dalmatian suede cloth inner and black and white snaps. I love the contrast of the colors and it also looks great in the new One Size KND. 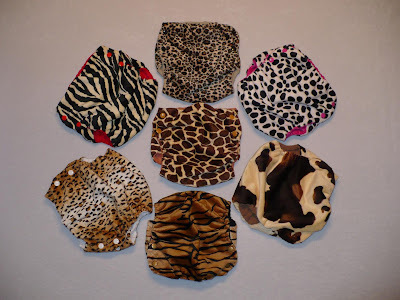 I love anything with an animal print whether it be in minkee or PUL, on the outside or inside of the diaper. They are fun and gender neutral. Special Offer: Customs start at $17.95 but you can save 20% when you use Code KND20 at checkout for a limited time.